Dining here offers a blend of traditional and modern, with a cultivated touch. The wall-to-wall windows create an airy indoor space with impressive sea views. Or enjoy the full splendour of the Adriatic from outside, amidst the greenery or our open-air terrace. Throughout, the decor reflects the colours and textures of the Dalmatian landscape, with its limestone, lavender and olive trees. 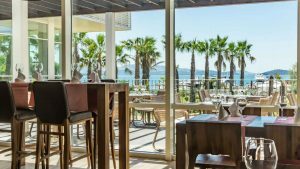 The food is equally inspired, capturing the true flavours of Dalmatia and prepared in an open-presentation kitchen that allows diners to see the chef in action. 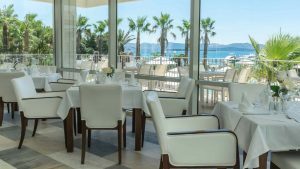 Enjoy magical island views from Ivan's spacious hotel restaurant featuring enormous glass windows and an open, expansive terrace facing the sea. 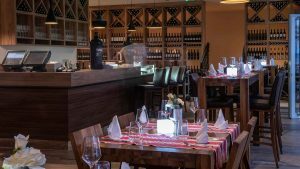 A rich buffet food offer featuring authentic Dalmatian choices and a meat carvery delight our guests every time, with feature meals highlighting fresh and seasonal local produce.